Philipp Plein developed his brand out of Switzerland from a vision that began over ten years ago. With a fresh and edgy aura, Philipp Plein is not only a label of high fashion, but also a luxury lifestyle brand. Aside from rocking high fashion for women, Philipp Plein has lines for children's wear, menswear, luggage, home accessories, kitchen, and more. Currently, the label has boutiques throughout Europe and Russia and plans to open new stores in Hong Kong and NYC. Lindsay Lohan is the new face for Philipp Plein, commanding several great shots for the Spring/Summer campaign. (I love her eyebrows in these pics!) With PP's catch phrase that I strongly support, PLAY HARD!, and the fresh and edgy feel that emanates from the brand, Lindsay Lohan seems to be the perfect face for PP. 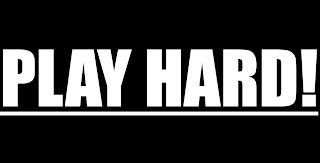 Personally, what I usually say is, "Work hard. 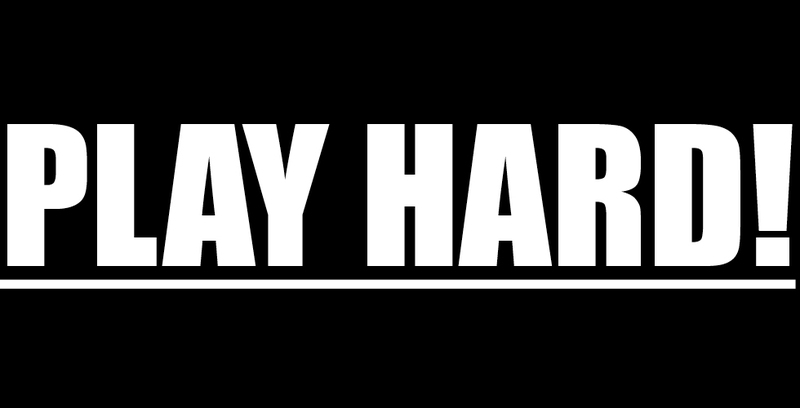 Play harder!" Philipp Plein is stroking my life philosophy! With claiming to be a luxury lifestyle brand, PP offers the proof, offering a view of Philipp Plein properties from around the world that leaves me lusting for more. From terraces, spas, and mansions, any fan of design and aesthetics will appreciate this lookbook of interior design, architecture, and vistas. And now for the fashion! I chose the below look from the Philipp Plein Fall/Winter 2012 show because I love it, of course. There is so much going on with this outfit, but each piece works so perfectly with each other! It reminds me of a Lanvin necklace I posted half a year ago, not because of the style, but because of the amazing combination of strong pieces that perfectly compliment each other and create a unified look. In the case above, it's the patterned and flowy blouse, the huge fur vest with contrasting trim, the skinny leather pants with the stud detailing on the sides, and the neckpiece that offers a divine focal point. Not only is the styling to-die-for, but the proportion and fit are so flattering as well as aesthetically pleasing. This is nothing short of a power outfit. Don't be surprised if this ensemble shows up somewhere else on SugarSpiceStyle, because I truly think it is an exemplary look. Check out other signature Philipp Plein looks in the online lookbook. An aside: I denounce the use of genuine fur (I'm a convert), but I still appreciate the texture and feel, so I encourage wearing fine fauxs. Fine fauxs, not gross ones. A bit about philosophy: "unleash the beast." So, what is the beast? The beast is, as Freud would put it, your most intense drives, pleasure-seeking behaviors, and completely unrestrained self. It's almost animalistic. Ultimately, it's free and it's about what feels good. And, well, you really can't argue with being free and feeling good. Indulge, be spontaneous, and unleash the beast! It's quite the message. This particularly resonates with me; a week before I explored the Philipp Plein site and found this, my friend and I were laughing about our releasing our inner beasts. I was quite enthused to see this! The Glamrock glove is one of my favorite items that is currently available for purchase. These are a wardrobe must for the accessory-addicted. Definitely extravagant, edgy, and classy, they are definitely a SugarSpiceStyle piece. On another note, I'm pining for fashion gloves to hit the runway. Please!! Philipp Plein: "The Heart is Every Detail"
**All photos in this post and quotes, unless otherwise stated, are from the Philipp Plein website. If you follow SugarSpiceStyle, you know that I am an avid fan of the shoulder-bag tote. What could possibly be more convenient for shopping, travel, or a low-key day around town? At one point in my life, I was into "switching bags." Don't get me wrong, I have much respect for the person who takes the time to switch her wallet, lip glosses, and the kitchen sink from bag to bag depending on the current outfit. However, I am challenged when it comes to time management and organisation, so the grab-and-go approach is just more functional for me for daytime wear. If you happen to fall into the latter category and want a tote that is casual, versatile, and durable--and, lets not forget!--suggests a sprinkling of some sugar and spice, I highly recommend the following totes. 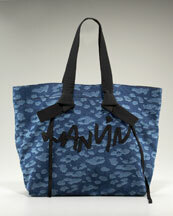 The first two are denim totes; the last two are either PVC or coated canvas. These are all under $500. Leopard? check. Ribbon embellishment? check. Piece of Designer Heaven? check. The only thing that could possibly make this bag any better is if it were on sale...and it is! 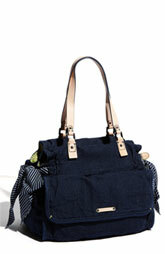 From an original $788, this tote is a notable >50% off. A piece of fashion trivia: Alber Elbaz is the current acclaimed designer at the Lanvin house. I love the dark wash of this tote and the adorable bow accents. The smaller compartment in the front makes this a very user-friendly tote. I'm also a fan of the Juicy Couture name plate front and center that offers a focal point, considering the symmetry of the bag. 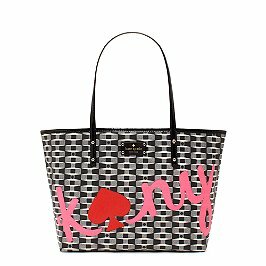 This tote has SugarSpiceStyle panache in spades! Of all the bags here, this is definitely my favorite, even though it's slightly more limiting because of the pink and red (but I do love the color combination; it's one that started to appear on the runways and fashion mags last season). This bag is a head turner that offers enough aesthetically pleasing visual stimulation for even the most demanding sensation-seeking fashionista. I can never get enough neon, and neon accents surpisingly work with much more than what you'd expect. As far as durability goes, PVC can't be beat. If you're really hard on your bags, PVC is the way to go. 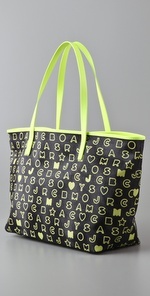 The above Eazy Tote by Marc by Marc Jacobs is shown in Midnight Purple, but is actually black in color with neon yellow/green leather trim. 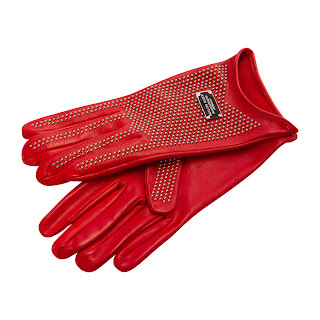 This same style is also availabe in blue with green accents at Nordstrom for $198. Take note of the texture of this bag using the zoom features on each site; the PVC is not smooth but has a haircalf texture. My guess is that this characteristic needs to be "felt out" in person; not a problem since Nordstrom and ShopBop both offer free shipping and free returns on any order! Although white is a color that has only relatively recently started to be embraced year-round, it absolutely belongs to summer. Warm nights, breakfasts on the patio, outside happy hours, and crisp white accessories. Nothing looks better with a tan (faux, of course) than the contrast of white. Not to mention, white compliments every color or is perfect for a monochromatic look. 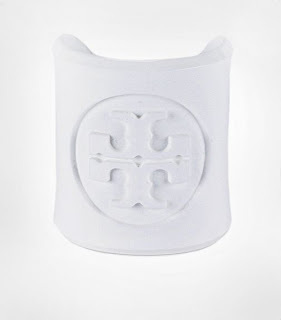 This cuff delivers designer love with a dimensional Tory Burch logo and is extremely versatile, one of my main fashion cores, both as far as other wardrobe pieces with which it would work and considering its potential for casual wear or more dressy attire. Although this cuff is perfect for many outfits, it just screams to be worn with the right maxi dress or mini pencil dress. Some other factors to consider: this cuff is a timeless design, and it is made of resin, so it should wear well. For all of these reasons, this piece is well worth its weight in gold, and definitely worth its $45 pricetag.